I love kiwi fruits, but I always buy them rock hard, wait forever for them to soften up and then I forget to eat them altogether. 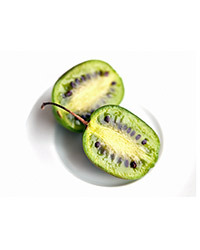 Lucky for me (and you), bite-size kiwi berries are just coming into season now, and you’ll find them at well-stocked supermarkets and specialty food shops. They’re about the size of a grape, with super-smooth, thin green skin, sometimes tinged with gold or deep red. Sweet, tart, juicy and usually sold ripe, they’re ready for popping in your mouth, no peeling required.